Preheat broiler on high. Place salmon steaks on a cookie sheet with sides and sprinkle with salt. Adjust rack to be approximately 4 inches from broiler. Broil salmon for 3 minutes on each side. 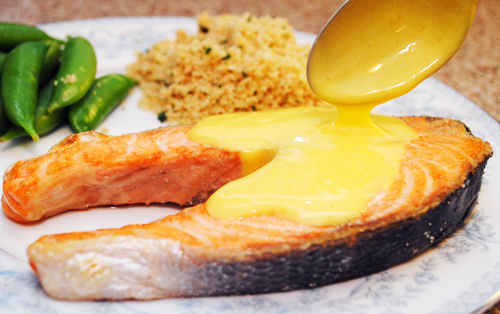 Serve salmon steaks warm with 1/4 cup Hollandaise Sauce per serving.